The British family of Guantanamo detainee Shakar Aamer, who has twice been cleared for release by US authorities, have pleaded for Prime Minister David Cameron to again raise his case with President Barack Obama. Hagel’s admission follows President Barack Obama’s promise to prioritize the case of Aamer during a meeting with Cameron at the White House last month. British officials hope to persuade US authorities to return Aamer to the UK amid fears he could be sent to Saudi Arabia, the country of his birth. It is believed the father of four will not be safe if he is dispatched to Saudi Arabia. Lawyers for the British resident have written to Cameron asking what assurances Obama gave him during his meeting last month. “The US Defense Secretary’s admission that Shaker’s case isn’t even on his desk suggests that Obama’s claims to be ‘prioritizing’ it may be little more than weasel words,” Stafford Smith said in a statement. “Shaker has been cleared for release twice by the US government itself. The UK wants him brought home. It is an affront to justice that he continues to be detained, without charge or trial, 13 years after his arrival at Guantanamo,” Stafford Smith said. Valentine’s Day marks the 13th anniversary of Aamer’s arrival at Guantanamo Bay, an occasion his family are marking by making an emotional plea to US authorities. Speaking to Sky News on Friday, Aamer’s youngest son, Faris, told how he has never met his father. “It's upsetting and quite shocking that I've never met him in my entire life,” said the 13-year-old, who was born on the same day his father was imprisoned at Guantanamo. Faris’s 15-year-old brother, Michael, spoke of how happy the family was when Shaker he was first cleared for release in 2008. “We just felt more sad because nothing happened. We've seen other people with their parents ... seen how they enjoy themselves, how they're so close to them. 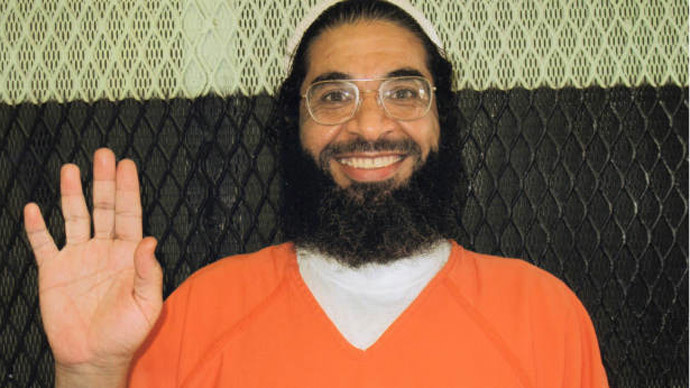 Aamer is the last British resident held at Guantanamo. Born in Saudi Arabia, Aamer took his family and pregnant wife to Afghanistan in 2001 where he says he was working for a humanitarian charity. Following the 9/11 attacks, his family fled to Pakistan, while Aamer gave himself up to the Northern Alliance – the anti-Taliban military front. They in turn handed him over to the Americans. Following detention at Bagram Airbase he was transferred to Guantanamo Bay. The Pentagon compiled a list of allegations, accusing him of ties to al Qaeda. Aamer denies the allegations and his supporters say he would have not have been cleared for release if he posed a genuine threat to the US.